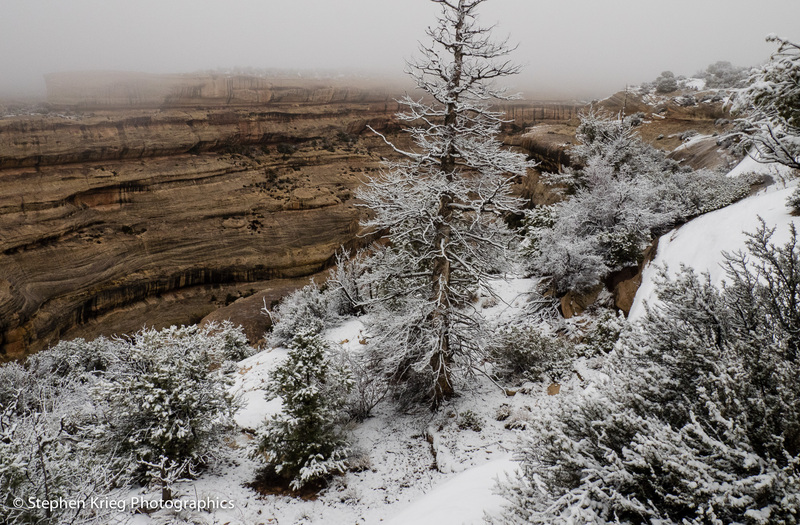 White Canyon rim in fresh snow white, Natural Bridges. The last day of January, 2015. As usual I didn’t think much about it, in that it was the last day of the first month of another new year. I just got up early as usual, hopeful to get as much out of the day as I could. A snowstorm had arrived the day before. Good: we need the moisture. This one would linger for two days. So, even better, though it wasn’t predicted to be a heavy one. As the day dawned I could see that we had a new coat of snow sticking to the ground. As the daylight brightened more, I couldn’t see all that much more, because it was foggy. Bright soft wet snow clinging to just about everything. Lovely. It would greatly limit my photographic horizons for the young morning. But who knows what it might reveal, too. So I drove out along White Canyon, the overlook road to the Natural Bridges. I didn’t have time to hike down into the canyon. Just as well: I was glad to be experiencing the day with the pure new snow and the fog softly blotting out the sky. The fog clung to our Cedar Mesa top for most of the day. But the storm front was moving east, so the clouds must be dragged away with it. The higher landmarks began appearing in the clouds. The Woodenshoe Buttes. 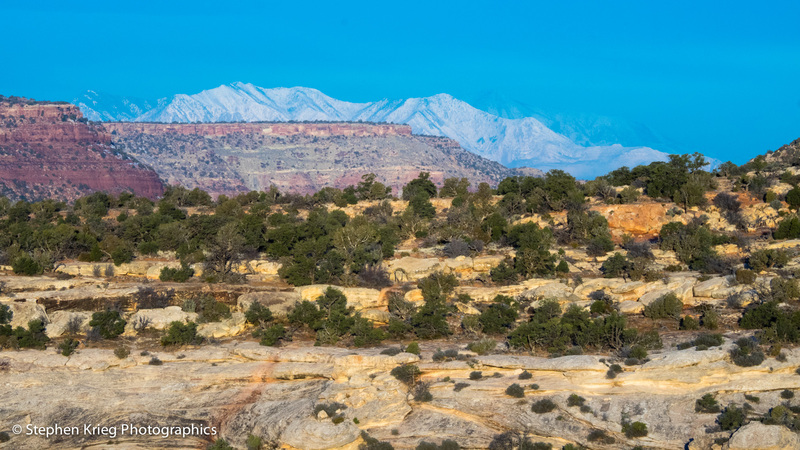 The Bears Ears Buttes. Some blue sky, even, later. Woodenshoe Buttes, above Deer Flat and White Canyon. Thus evening light was shaping up in a big way. Back out to re-cover the morning’s drive I went. Clouds lifting more, blue sky, the nearly full moon in the east. Waxing moon at Maverick Point. I drove out to Maverick Point for the sunset. That wide open view. I watched the sunset colors fade, then returned home. 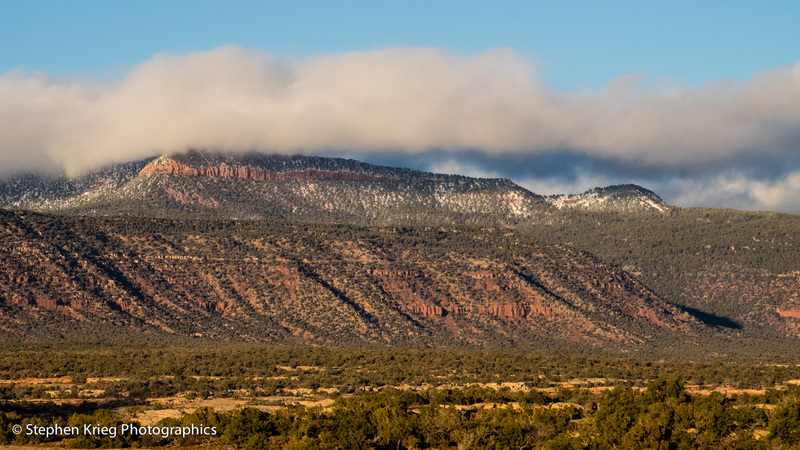 Cedar Mesa sunset clouds, from Maverick Point. 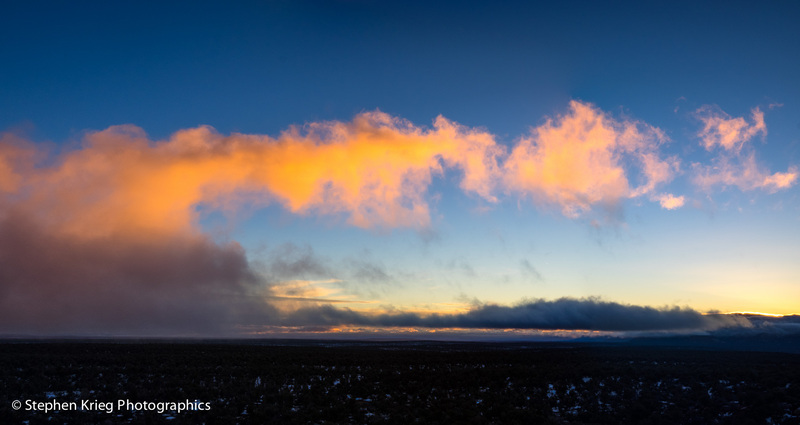 A fitting end to January here at 6,500 feet in southeast Utah, on Cedar Mesa. Underneath Kachina Bridge west buttress. 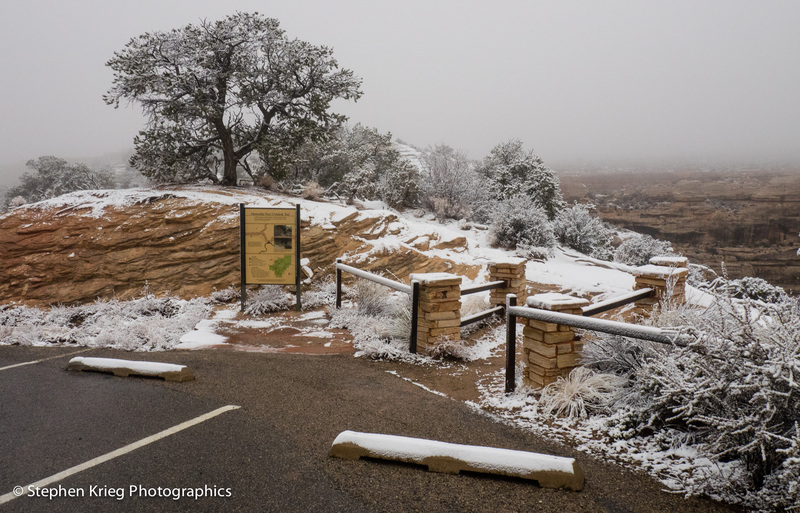 January at Natural Bridges National Monument in southeast Utah. Savoring the dead of winter sunlight on the upper edge of the high desert. One of the most special places I’ve been privileged to visit. So far. Down the trail to Kachina Bridge. After the snow storms, this one has melted back to bare rock, an easy trek. Warm sun in the cold winter afternoon. Kachina Bridge, from mouth of Armstrong Canyon. Down at the bottom of White Canyon, I look up at the massive, thick arc across the stream bed. Since the stream slowly but surely created the hole in the sandstone, the shortcut, abandoning its old outer meander, it a natural bridge. 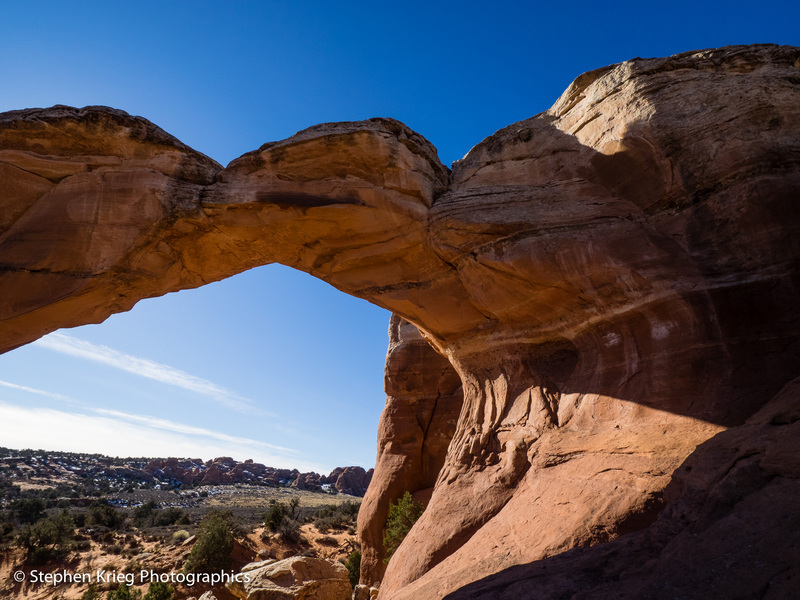 Not an arch. Unless you’re a geologist or naturalist, you don’t care about the scientific distinction. But like them, you appreciate the beauty. That’s what matters. 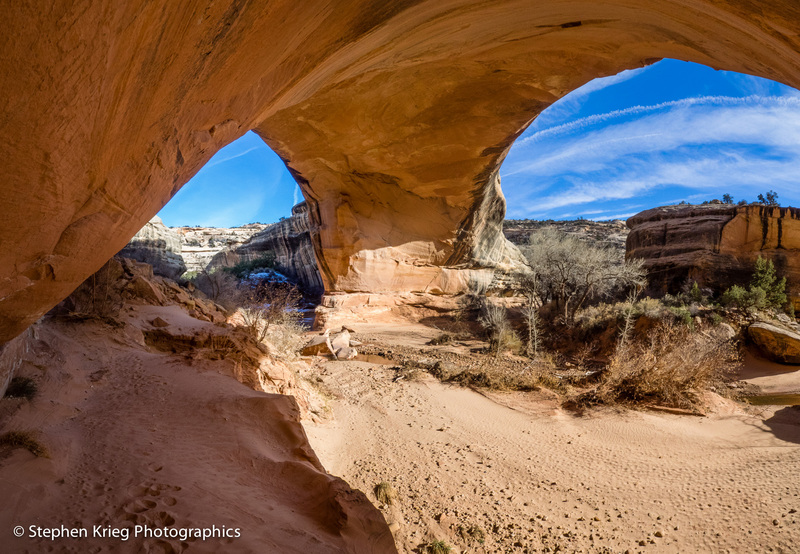 Photo location: Natural Bridges National Monument, San Juan County, southeast Utah, United States. Deer Flat Cliffs above White Canyon. 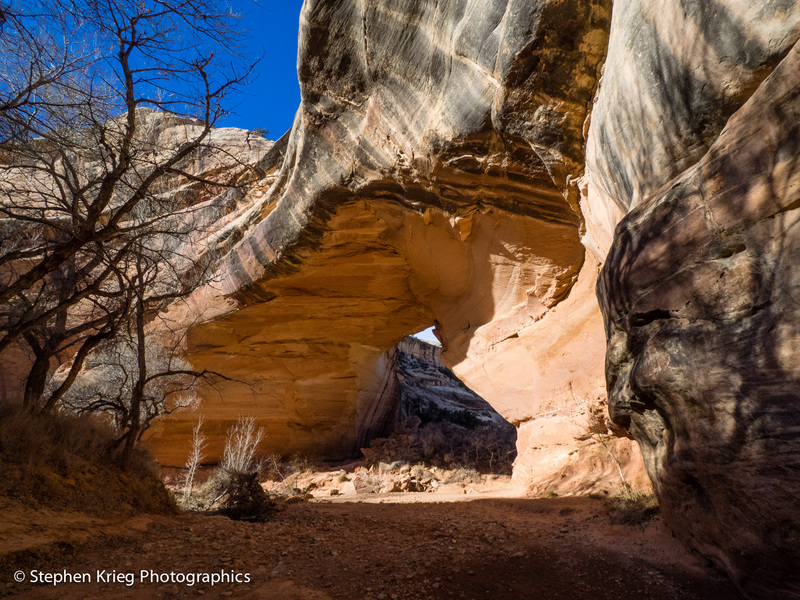 A January morning at Natural Bridges National Monument in southeast Utah. 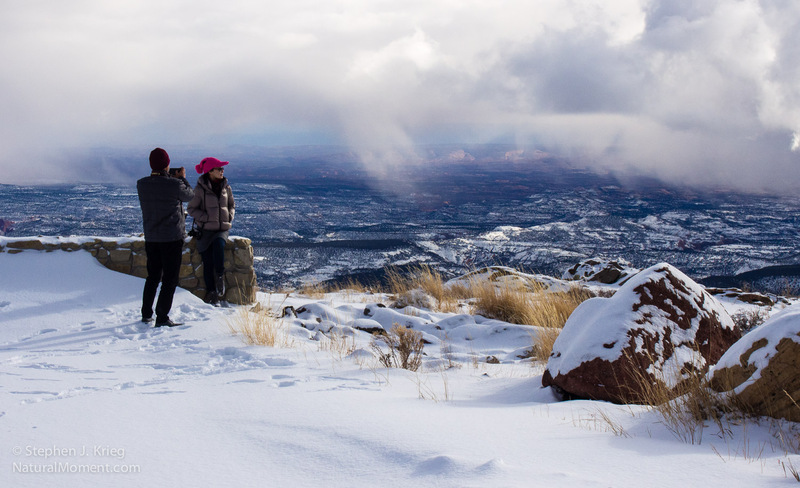 A few days after the latest snow storm, so the mesa tops and high ridges were freshened up. I like that. I hate to see the white stuff melt, although I am looking forward to spring just the same. The Henry Mountains from Natural Bridges, long lens. As usual at this time of year, I had the Bridge Loop Drive road all to myself at sunrise. Me and one of the park’s maintenance workers doing his morning rounds. The National Park Service employees here really keep Natural Bridges looking so good. Along the loop drive, there are a few spots where you can see part of the Henry Mountains on the far horizon. 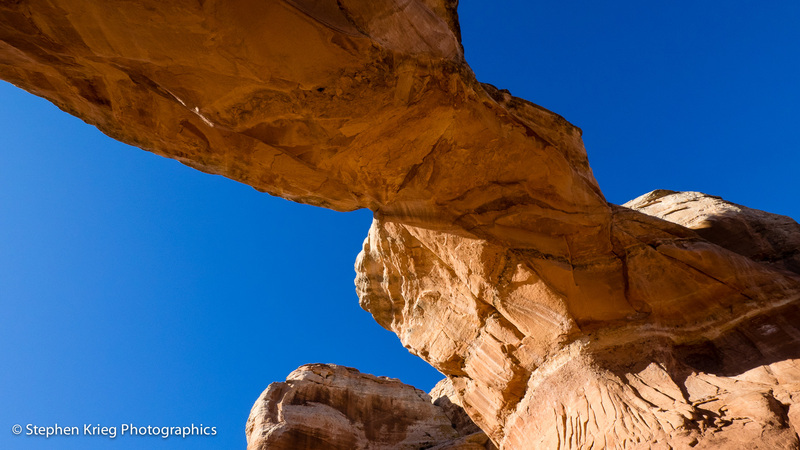 The Henrys are about 90 miles west of Natural Bridges, west of the Colorado River and Glen Canyon. Way over near Hanksville and Ticaboo, Utah. 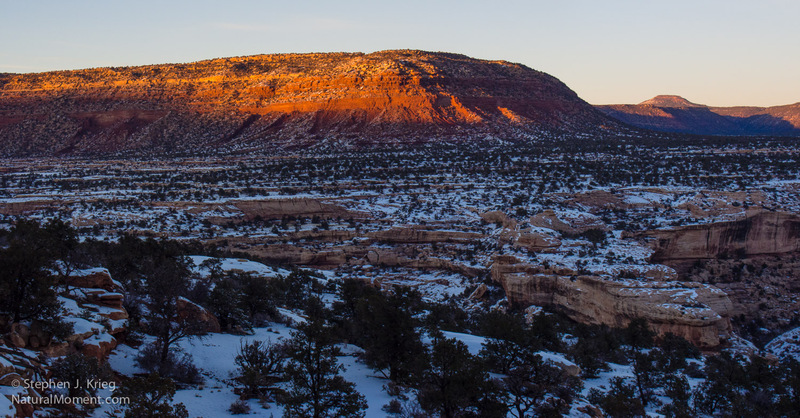 Sunrise on Cedar Mesa Sandstone rim of White Canyon. Not enough time that morning to hike down to any of the bridges, not even Owachomo Bridge, the easiest one by far. I was merely making use of the early morning to enjoy what I could. And I did. Moss Back Butte from Natural Bridges. 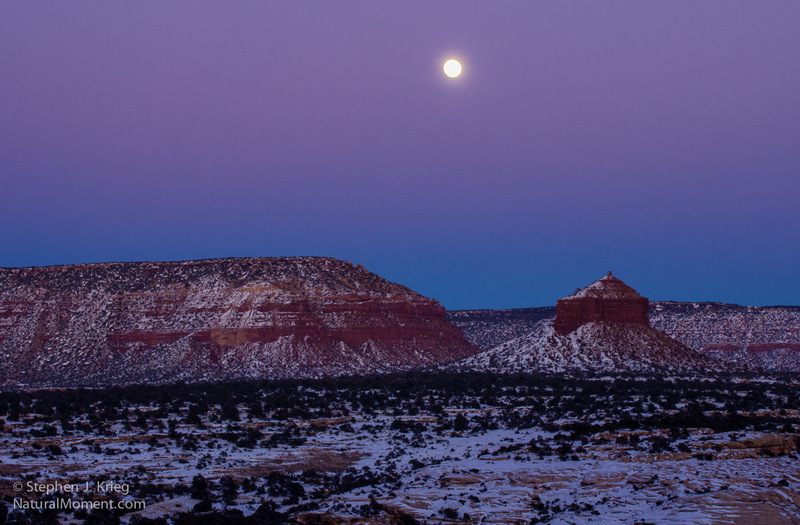 Moonset at dawn, Cedar Mesa, Utah. It was time to leave Cedar Mesa. Just for a bit. To drive outward in my constant yearning for more photographs. On the way out of Natural Bridges I pulled over onto the wide shoulder of the curve I call Sunset Curve. It’s not listed on the map that way, but it doesn’t have a name so I gave it one. Moonset from Sunset Point. It’s fitting in that it’s another reflection of the ongoing cycle of the days. Note that the moon was already behind a thin haze of high clouds. It would get worse as far as seeing the moon that morning, but the best was yet to come. 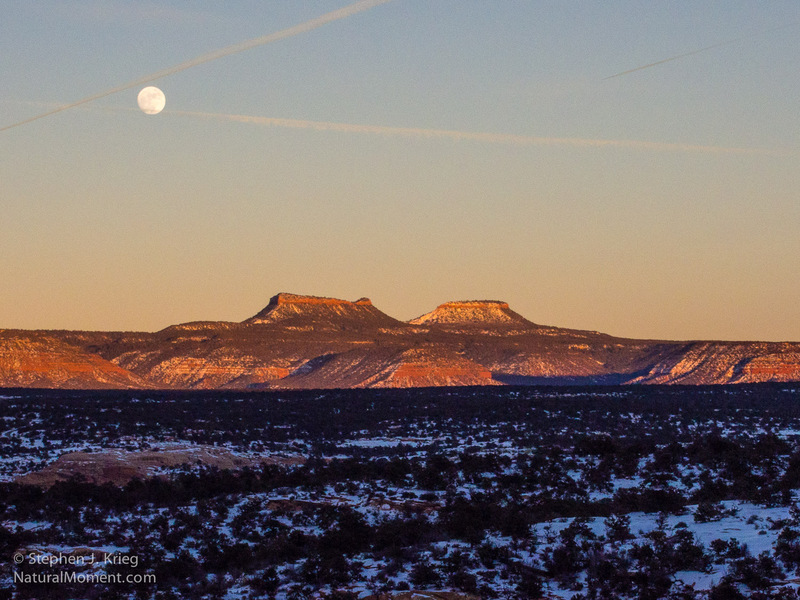 Sunset moonrise over Bear’s Ears Buttes. Time for the Full Moon report, January 2015 edition. It was a split decision. 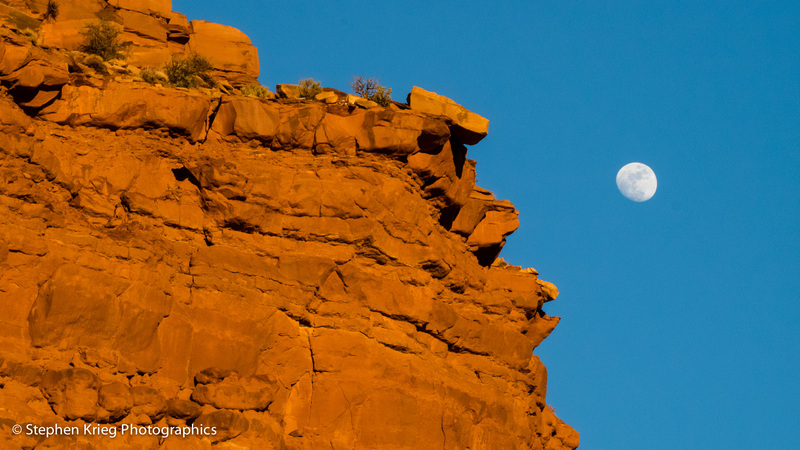 The evening before Full Moon was great, allowing me some wonderful shots here in Four Corners Canyon Country at sunset time. Though, being one day before Full Moon, it was already up somewhat higher in the sky than I would have liked. Thus requiring more wide angle landscape shots, making the moon much smaller in proportion. 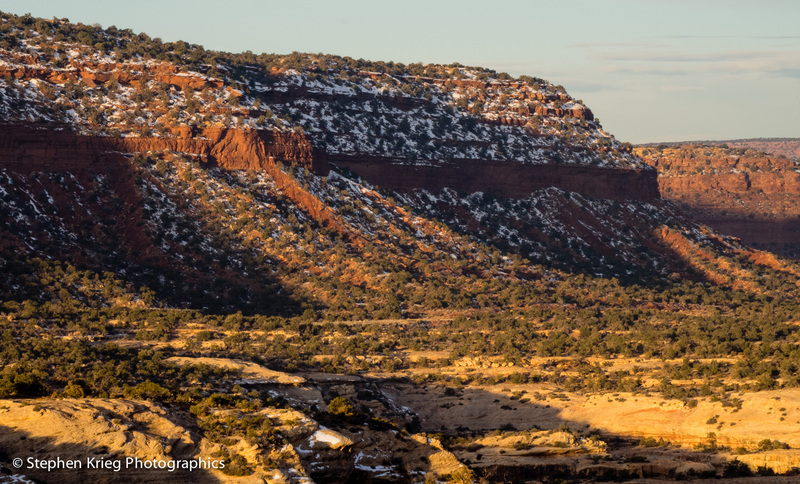 Last sunset rays on the cliffs above White Canyon. Still, I used the evening to scout out new locations for the Main Event the following day. The rise of the Full Moon, at sunset. Though in the opposite direction. I hope that’s a given in your mind. 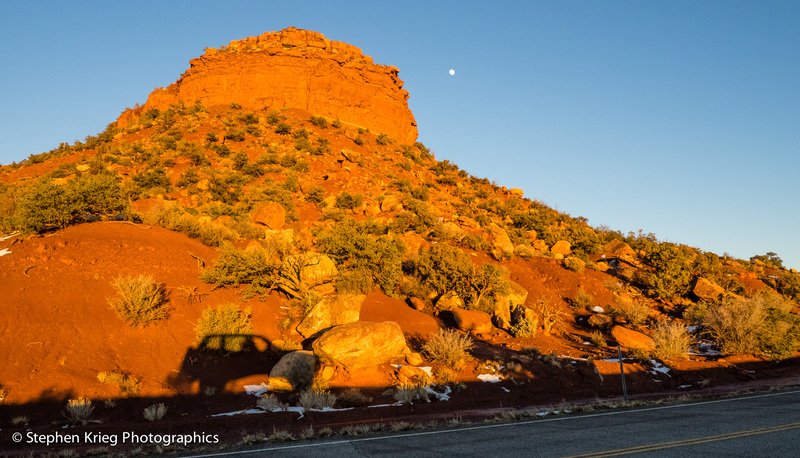 Driving my way down along White Canyon in southeast Utah, I enjoyed both the cliffs with the last red rays of the sun on them. Then, a few minutes later, the encore: the blue shad0w 0f the Earth, with the Venus Band of pink gradations above. And…supreme icing on this cake, the rise of the nearly full moon. 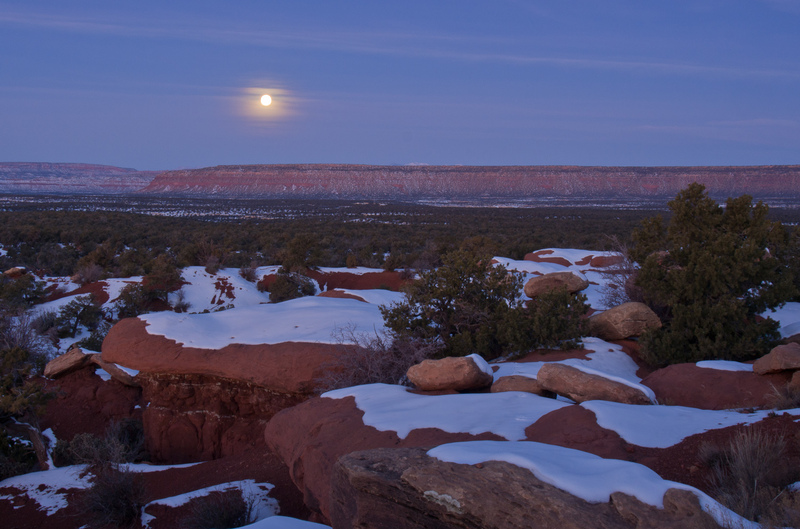 Moonrise at dusk, above White Canyon and Cheesebox Butte. The old saying is to “make hay while the sun shines”. In this case, make photos while the light is right. Because tonight, the next day, the high clouds aced me out. No Full Moon moonrise shots. Making me even more glad that I hustled out there last night to get what I could. Only one car passed by on the wonderfully lonesome highway while I was there. So peaceful. Along Highway 12, Tropic, Utah. 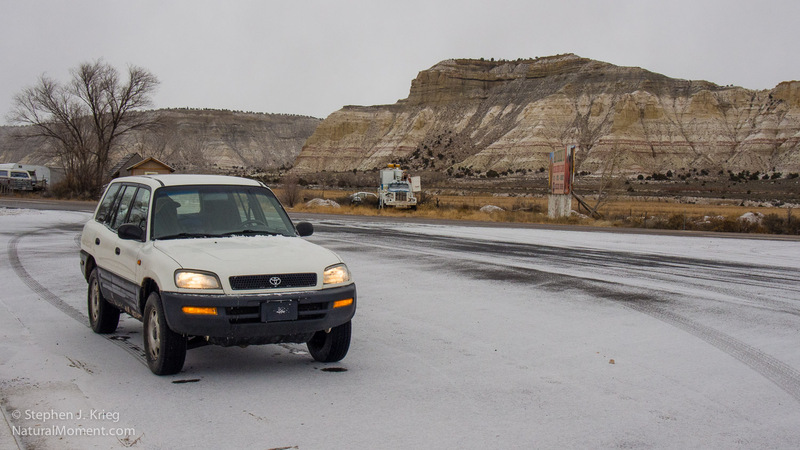 So it was Christmas day across southeast Utah. Snowing. A dry, powdery snow, so the roads were mostly clear. Pretty easy traveling. I was using the opportunity to revisit some of the places there I’d not been to in several years. 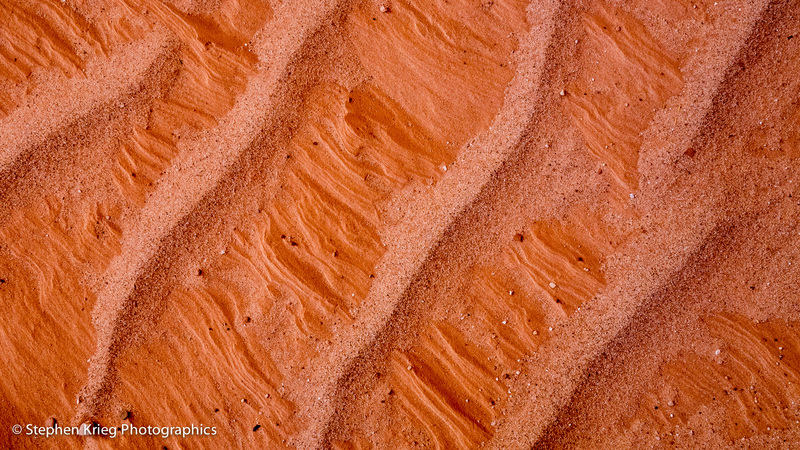 From Bryce Canyon, down to Tropic (wistfully named, it seemed, in the winter weather). Across the headwaters of the Paria River, so far above its mouth at Lees Ferry on the Colorado River in northern Arizona. Upper Paria River, Tropic, Utah. 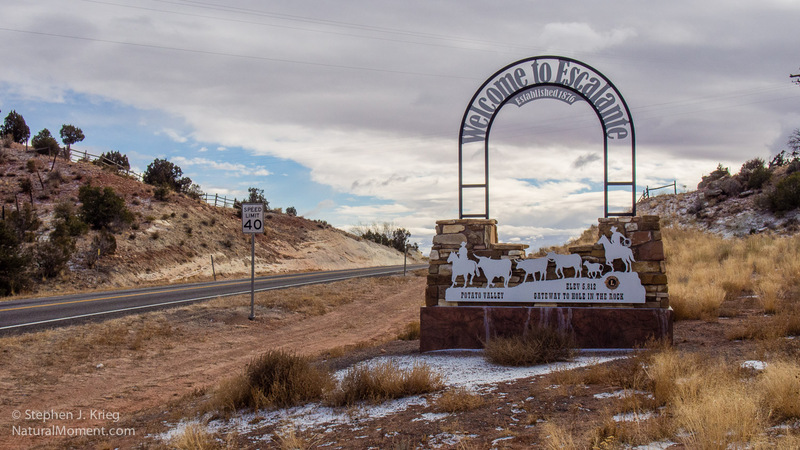 Over to Escalante, a canyon/mountain town I’ve been wanting to get to know much better (maybe this is the year!). West approach to Escalante, Utah. 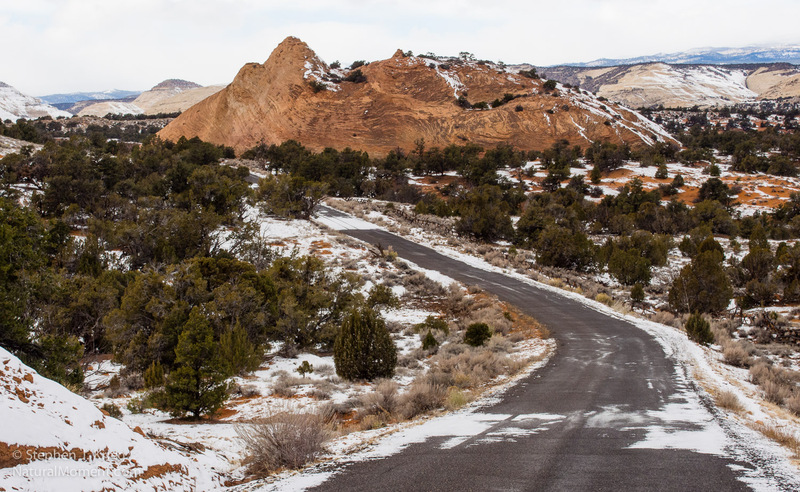 Up and over to Boulder Town and the dazzling Circle Cliffs, at the head of the Burr Trail road. Near Boulder Town, Utah and the Circle Cliffs. 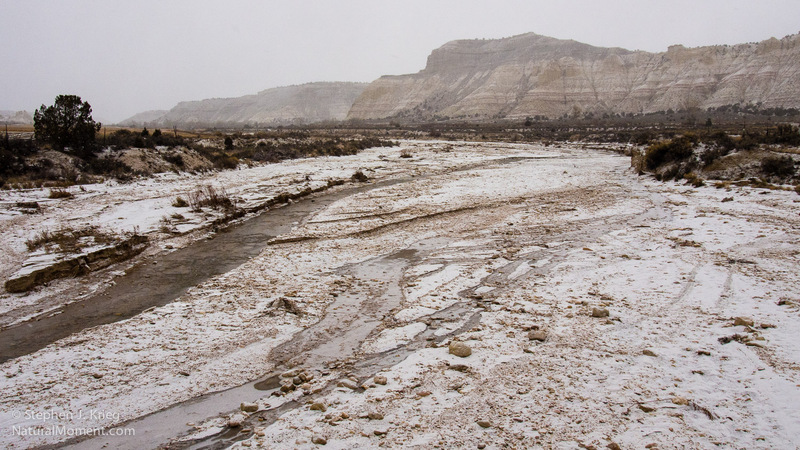 Up across the much more wintery shoulder of the Aquarius Plateau, looking down on the Waterpocket Fold. And a whole lot more country all around. Tourists along Highway 12, Aquarius Plateau, Utah. 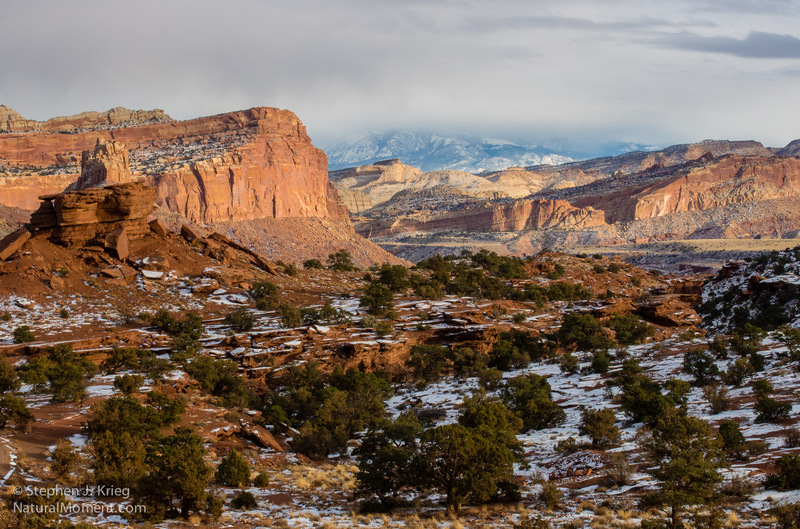 Then down to Capitol Reef, so named by the pioneers because it was a formidable, though awesome, barrier of jagged cliffs. This region is rife with interesting names. The scenery isn’t bad, either. All content © 2014-2015 Stephen J. Krieg.